From 2016 to today, two of the top ten buzzwords in Digitial Marketing have been Native Advertising and Artificial Intelligence. They are very important topics and will help drive the future of Digital Marketing as we know it. However, for most marketers, and those who are attempting to reach marketers with online content, these two topics are misunderstood. 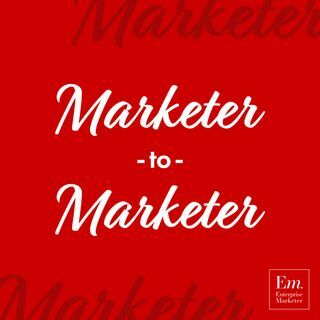 In this episode of Marketer-to-Marketer, Chad Pollit, Author of the Native Advertising Manifesto, and Paul Roetzer, CEO of PR ... See More 20/20, dive deeper into these topics and give us a State of the Field for each Native Advertising and AI. The conversation does a great job and driving insights and connecting these topics together in the context of Content Marketing. - Yeah, you got me doubled up. You got me doubled up. So we've been in this space a long time, we've dealt with lots of different companies from SNBS to enterprise companies and we've seen the evolution of marketing and digital marketing, content marketing, so on so forth. What's the hottest thing on the horizon that's here today that's going to be even bigger tomorrow? - It's so fascinating when I was actually, Travis Wright, we both know Travis. Travis was just talking to me about Blockchain which I still just don't comprehend. And in three years we can come back and watch this and laugh that I have no comprehension of it right now. But that's one of those things that I just don't get. And I've tried now to get into that space. I think that one's still a ways off. Like I think from a marketer perspective and really caring about it and seeing it effect our daily lives, that one's really out on the horizon. Artificial intelligence to me is the one that's kind of here now. It's where I've been spending most of my time and you and I have talked a little bit about this with your work at the Native Advertising Institute and we had launched the Marketing Artificial Intelligence Institute, so our focus there was really just trying to figure out what is going on. Because you start looking around even here at the exhibit hall, you see AI over here on Acrolinx, and you go running and see artificial intelligence now being promoted on a lot of these companies, but as the average marketer, people one, don't really know what that means, and two, even if they do, it's hard to know how intelligent the software really is becoming. Like is it still a human telling the software what to do? Or is the software actually starting to learn and get better on its own? And eight months ago or so when we launched the Institute, that was the thing I didn't know. Like we would look at 100 companies that all said they did AI, and I had no way of knowing whether they truly did or not. And now we're at the point we're trying to actually start help marketers filter through that. Figure out what is AI actually capable of doing today to make your job easier, more efficient, more productive, and where is it gonna take us in the future? That's my talk on Thursday's machine assisted narrative. It's in terms of creating and promoting content how can artificial intelligence today make your job as a marketer more efficient? Which tools do you need? What should you be looking for? So that's where we're spending the majority of time now. So we still have our core agency but most of my time's in the AI space tryin' to learn about that. - So would you say that for something to be truly AI, it has to have machine learning? Or is it more than that? - Yeah, so the basic on, AI is the umbrella. It's like the collective of technologies and processes that machines become smarter basically. So Watson is the one everybody knows or everybody's like familiar with Watson. Machine learning and deep learning are kind of the two main subsets within artificial intelligence. And the basic way to look at what is machine learning is does the software get smarter on its own? So an example would be, if you use a software to tell you when to schedule your social media shares. If there's some tools here that'll do it, say, "Hey send it at 3 p.m." Jay mentioned in his talk this morning, send it at 3 p.m. Well that's a data scientist. They just looked at a data set and said, "Okay the optimal time to send it is this." And until that data scientist or the programmer updates that rule, it will continue to be a human based rule that said when the best time is. In machine learning, the algorithms actually in real time monitor when that optimal time to share changes and what the optimal share time may be for your specific company. And it would, so today it might say 3 p.m. tomorrow it might say 1:44. That's machine learning. It's actually the machine with no human guidance getting smarter and updating what it recommends you to do. That is very rare to find in marketing software today. So there are marketing tools that are using types of artificial intelligence, very few of them are actually getting smarter on their own and thereby changing what they would guide a marketer to do. So that's the machine learning thing I thought a year ago was much further along than it really is in the marketing space. There are lots of really interesting things being done with AI and really interesting companies, but not much in the way of machine learning. - Gotcha. So what do you think of Salesforce's Einstein? - Salesforce is interesting they've made massive bets, so they I think bought about nine AI companies, couple billion dollars worth and then they mashed them together into Einstein and it's basically a layer over the core CRM product. So that's the other thing in AI's. There's no platform. There are narrowly built use cases. There's software built for narrow use cases and in Salesforce's case they try to mash these all together. Early feedback I've heard is it's really interesting it probably helps a lot with efficiency, but it's not fully baked yet and it's, like a lot of software companies it was probably announced before was truly what it's capable of doing, so I think, I wouldn't they're by no means in a beta form, but they're in very early stages of realizing AI's potential and actually integrating it into the software. - [Paul] How bout you? What's the thing you're focused on? - [Paul] Were you in Europe? - No, well I did spend a little bit of time in Europe, but no, I actually took a lot of time off. Spent it with my kids. In fact for over a month I didn't touch my desktop, which is where I do all of my work, so, I lied actually I think I touched it four, three or four times. But I, that's the first time I've done that in 17 years in the business. - Yeah, yeah. Exactly. Because as you know I teach at the Indiana University Kelley School of Business and the summer is my real time off where I don't have to deal with students, and not that that's a bad thing, but I don't have to grade papers, lecture, things like that. So if I wanna take a significant amount of time off, I have to do it in the summer, so I did. Which by the way, if you haven't taken three to four weeks off in a long time, I recommend trying. - [Paul] Not since college. - So yeah, I'm still tryin' to lead the way in thought leadership when it comes to content promotion and distribution, both paid and earned. I feel like a lot of people have sort of hogged up that influence or marketing earned side, of earned content promotion through influencer marketing. So I focus most of my attention on the paid side. So earlier in the year I spent nearly a month just researching the native advertising tech landscape. And what I discovered was there's over 272 companies that are involved in native advertising, someway on the technology side. - So native advertising is content that matches the form, feel, and function of the media that surrounds it. Okay, so a good way to think about it and to get clarity around native advertising is anything in feed that looks like it's supposed to be there. It can say sponsored. So Facebook's a perfect example. You see sponsored posts there, but it's in feed and it looks just like everything else, it just annotated as sponsored. - So sponsored content, native advertising, same thing or are they, is there distinctions? - So this is a big problem in native advertising. You also have something called long-form native advertising. And the most famous example of that is Netflix's Orange is the New Black in the New York Times. - Melanie. Melanie wrote that article, she's here. So that's native advertising too. - So the reason I bring that up is because to your average person that Facebook ad and that entire article in the New York Times, are totally different things. But they're not. They're both sponsored, they're both in feed, in the natural feed of the website, and they're both paid for. Okay so there's really, there's four categories, there's long-form, programmatic, non-programmatic, the fourth one is social media. - Those are not the IAB categories, those are the categories that I've come up with because I don't like the IAB's categories.